This space has been fairly quiet this year, and while I'd like to blame my lack of posting on work, the truth is that most of the blame falls on ye olde personal life, which has been in a dumpster since early November. But rather than going into the sordid details here, I'm going to post on something that was big on Twitter a couple months ago, thereby continuing my present trend of running behind (on the blog — thankfully not elsewhere). 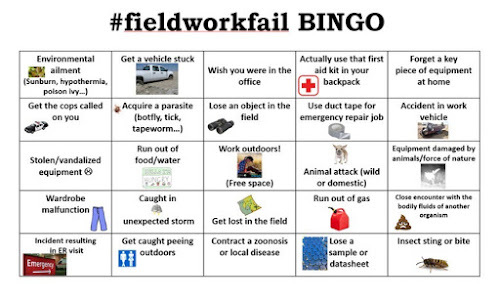 It was Kat Black who presented this Bingo card to fieldwork-Twitter (largely but not entirely composed of biologists and geologists of various flavors), back on the 30th of March. Most of the entire ensuing Twitter convo can be read here (though I don't know how long Twitter-search keeps things available, so maybe the link will fail in the future). 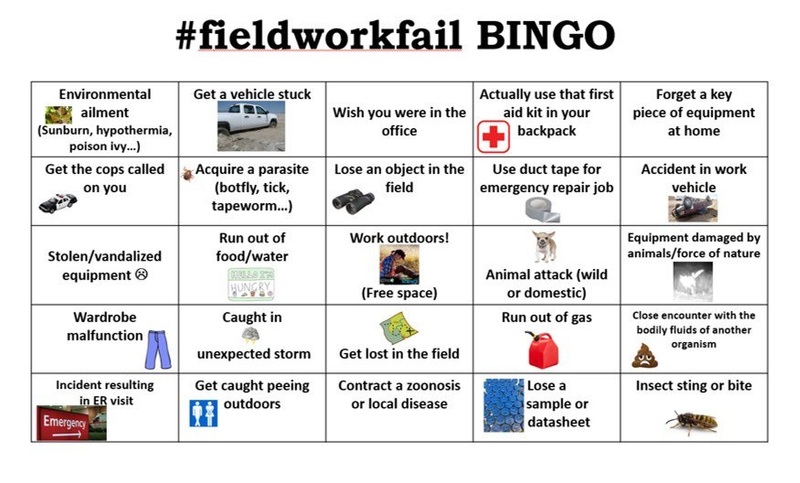 Thinking about my field work history in some detail, I created this BINGO card from my experiences. 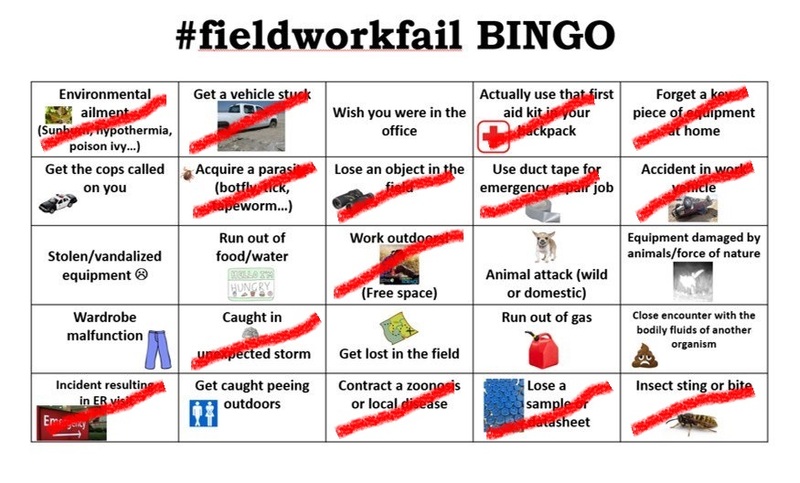 As you can see, I did get a BINGO. 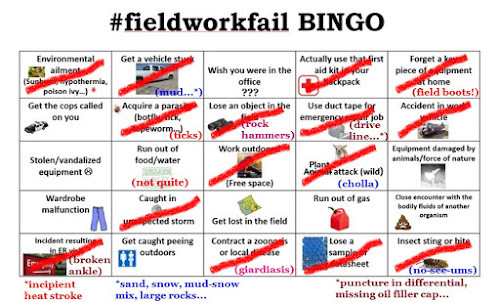 Without the free space in the middle, though, I wouldn't have made it. You might notice that I replaced "Animal attack" with "Plant attack" and added an extra mark. While I've been stared at closely by 3 to 4 coyotes at once and also by a protective stallion once or twice — the former causing me to unnecessarily grab my rock hammer and the latter causing me to give up on that canyon for that day — I've never been attacked. I have, however, been mercilessly attacked by wild cholla balls, which definitely have a mind of their own and can be quite persistent in trying to attach themselves to parts of your body, especially feet and legs. In my line of work, especially when doing mineral exploration recon, a moderately routine hazard not listed would be getting shot at or being run off a property with a gun, which has happened to me once (American Girl), maybe twice or thrice — although the second time was unclear and so probably doesn't count (Old Woman Mountains), and the third time was merely a threat without any visible gun brandishment (Tumco). In addition, there can be various helicopter-related hazards, the least hazardous of which might be being left out by the helicopter pilot, who for various reasons, including forgetting part of the crew (me! ), might not pick you up — a story that was told in brief here. 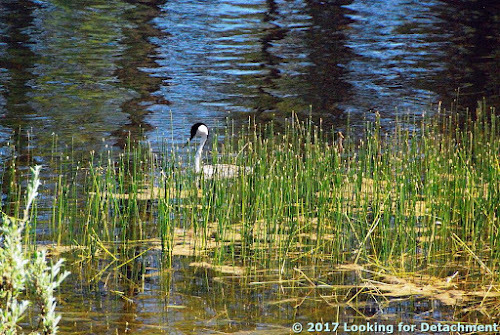 I've been meaning to get to this post for sometime, seeing as how the trip was made in the summer of 2017, and the post related to this one, set earlier in the same day and not all that far back up the road, posted in September of last year. 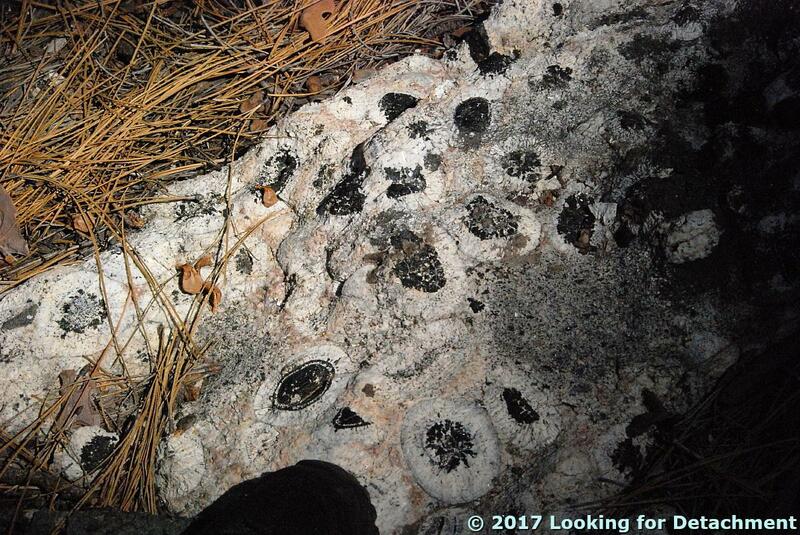 What we'll see here is some unexpected orbicular granite, found by MOH. 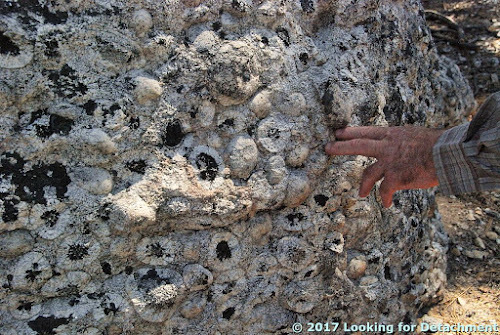 In this post, you'll see several pictures of orbicular granite, which in this case is composed of orbicules with dark centers and lighter outer rims. I didn't collect a single specimen, partly because the outcrop didn't lend itself to being hammered on, partly because it seemed like the single outcrop should be left alone. 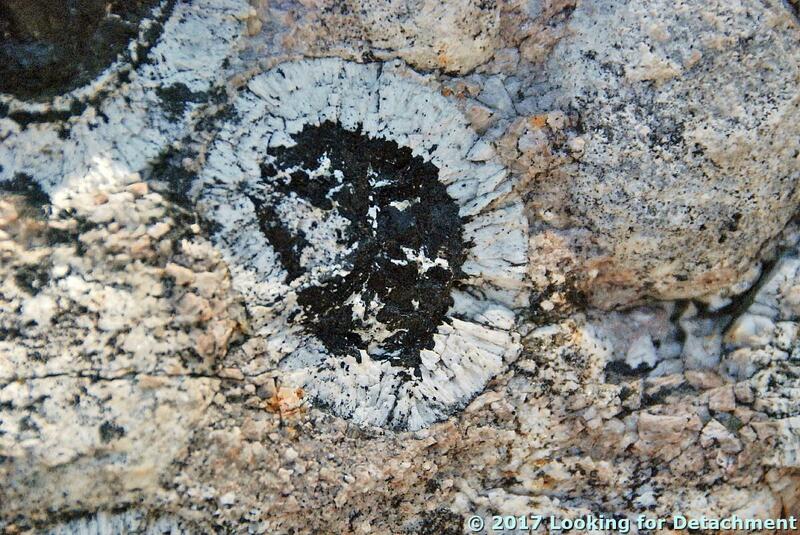 The inner dark center of most orbicules consists of black, interlocking and sometimes radial crystals of probable amphibole. It's fairly common that the next and only other layer is the outer rim of nearly white feldspar (not sure what kind), but in some cases (above and below) the second ring is composed of a white and black ring of intergrown feldspar and mafic mineral (pyroxene or amphibole are most likely), with white feldspar forming a third ring outside the second ring. The outer light-colored ring sometimes shows hints of actually consisting of as many as four or more separate feldspar-dominated rings or layers. I'm not really up on the formation of orbicules, so if anyone with more knowledge than I wants to jump into the comments and explain, that would be great. The discoverer of this small exposure provides a bit of scale for the orbicules, including a few protruding like eggs from the rock mass. It looks like many of the small spaces between the larger, often touching orbicules contain smaller orbs. 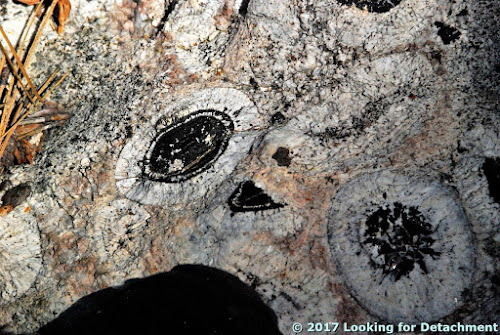 This particular orbicule appears to have at least three identifiable outer feldspar shells, set apart by somewhat vague mafic rings. 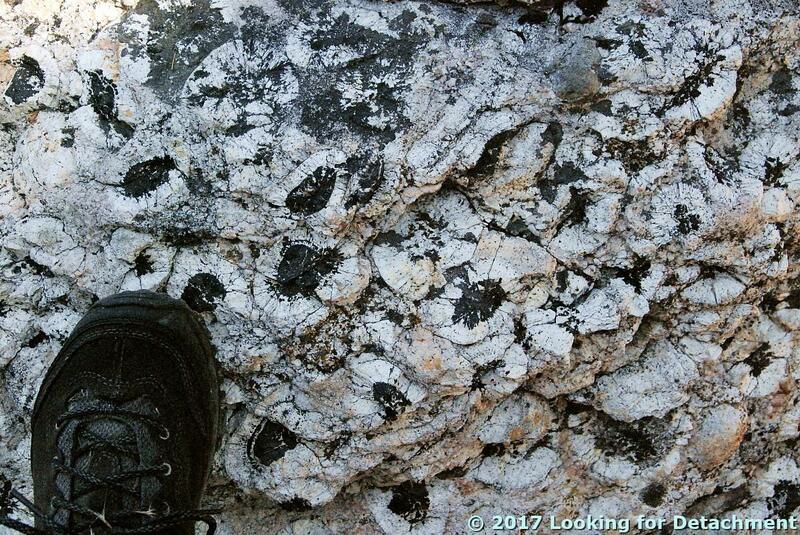 I'm not giving details of the location of this tiny outcrop in order to preserve it. 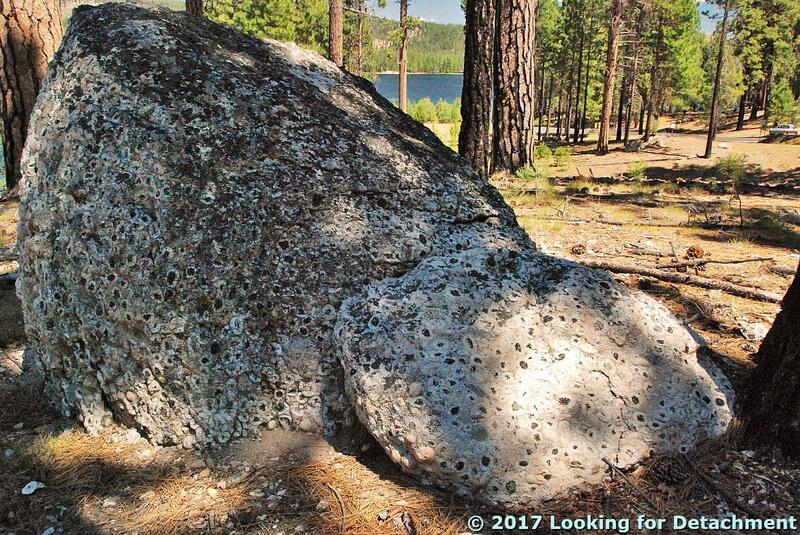 I didn't find anything about this locality by Googling, so this might be a new discovery.